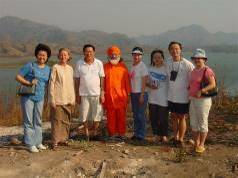 In Taiping Malaysia we had another teenagers camp on December 16, 17, 18th 2004. A group of 36 children attended the program. This time we focused on nature. The first day children were introduced to basic ecology concepts and ideas. We went for tracking in the rain forest and at the end of the day each child wrote a letter to a child 100 years in the future. The second day we visited a national reserve which is only 20 Km from our unit. We managed our way up the mountain to a paradisiacal waterfall. The third day we had a lot of fun with cooperative games introduced by some former yoga students (they are primary school teachers and have been teaching kaoshikii dance in the government school). Below is one of the letters the children wrote. I hope you and your family are happy and well. You are reading this letter 100 years after I wrote it. I am 17 years old, possibly the same age as you. Let me tell you about Mother Nature’s beauty which I enjoyed 100 years before you. The tropical rainforest where I am at now has many types of herbs, shrubs and grasses. Besides the plants, there are also tall trees whose tops almost reach the sky. What a sight! The greenery around me is refreshing. I am surrounded by green trees on all sides. I am also attracted to the cool waters of a nearby waterfall, so swift and clear. Animals are aplenty here: ants, leeches, monkeys and insects. I can hear them all. I heard these noises and sounds as I trekked through this rainforest. Some sounds were quite frightening yet some were so melodious that I strained to hear more. There were, of course, some challenging moments during my trekking. Some places were so steep that I had to grab onto tree branches to climb up. Despite it, I felt courageous. I believe you would like to experience this wondrous place. Yet I do not know if the greenery will continue to exist 100 years from now. 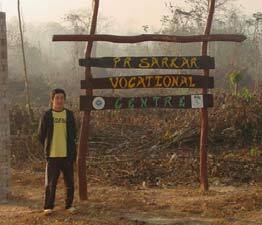 If forests are cleared continuously, I am afraid soon all animals, insects and greenery will be extinct. Landslides, flash floods, water pollution and air pollution will occur too. That’s why I hope you and your generation will continue to preserve nature. If you come here, try not to dirty or destroy this place. I hope you will be able to understand what I am trying to convey. I also hope you get to experience what I am experiencing now. The AMSAI school in Lapulapu, Cebu Province, Maharlika has been running beautifully for the last 12 years. Principle and school founder is sister Madhurita. This kindergarten school’s capacity is 25 students, and it is usually full each semester because it has an excellent reputation. Every year a large percentage of the students are accepted by high level primary schools after their graduation from AMSAI. The next graduation ceremony is scheduled for April 20th. The highest local government officials always attend our colourful entertaining ceremonies. Also in Cebu Province we have two much smaller kindergartens in Carcar. These two are attended mostly by children from impoverished families. Sister Laksmi is principle of both schools. There are presently 20 children attending. Dada Ramakrishna experiments with simple clay ovens and other appropriate technology at the P.R.Sarkar Vocational Centre. 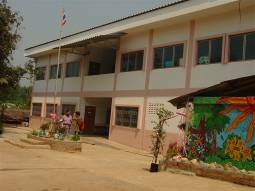 There was an inauguration ceremony for the new elementary school building in Baan Unrak Primary School, Sangkhlaburi, Thailand on February 19th. 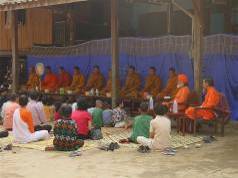 The program started at 9:30 am with the monks from the local temple as per tradition and included children’s performances and a collective lunch at 12 o’clock. 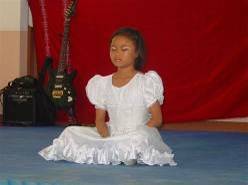 In the evening there were further performances with the school and home children. Mr. Chong, the contractor of the new building made a donation to the School for a handicapped child, and Didi Ananda Devamala received an award from the Ministry of Social Development and Human Welfare in Thailand. A group of supporters from Malaysia visited our projects in Thailand and participated in the Inauguration Ceremony. They brought a few boxes of school materials and other needs for the children during the Chinese New Year Holidays. Afterwards, Kulapati, Dada Shambhushivananda conducted an NHE training seminar with six teachers in the school. The topics covered included Fundamentals of Neohumanism, Specialties of NHE, Brahmacakra & Neohumanism and Questions & Answers Session. 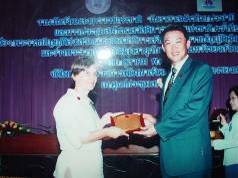 Sister Janaki translated into Thai. The new school building has 6 big classrooms, a science room and a library as well as a big office and a small counseling room. The dining facilities can accommodate 150 students. Now the new school year has just begun and enrolment is 19 nursery children, 18 KG children, 40 in grade 1 divided in two classes, 13 in grade 2, 10 in grade 3, 13 in grade 4, 9 in grade 5 and 6 in grade 6.